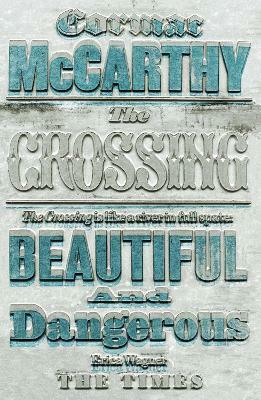 The Crossing forms second part of Cormac McCarthy's critically acclaimed Border Trilogy, that began with All the Pretty Horses and concludes with The Cities of the Plain. Set on the south-western ranches in the years before the Second World War, Cormac McCarthy's The Crossing follows the fortunes of sixteen-year-old Billy Parham and his younger brother Boyd. Fascinated by an elusive wolf that has been marauding his family's property, Billy captures the animal - but rather than kill it, sets out impulsively for the mountains of Mexico to return it to where it came from. When Billy comes back to his own home he finds himself and his world irrevocably changed. His loss of innocence has come at a price, and once again the border beckons with its desolate beauty and cruel promise. Cormac McCarthy is the author of many acclaimed novels, including Blood Meridian, The Road and No Country For Old Men. Among his honours are the National Book Award, the National Book Critics Circle Award and the Pulitzer Prize.